London smogs became famous in the 19th and 20th centuries. This is an eyewitness account by Flora Tristan, a Frenchwoman who visited the capital in 1839.Overseas visitors to London seldom comment favourably on the weather. Apocryphally, there are “eight months of winter and four months of bad weather”. Flora Tristan (1803-44) was no exception. Born in Paris, she published her first work in 1835 and became a socialist, her travels carefully recording her political activity and views of the world she found. In 1839, she visited Britain for the fourth time and wrote her London Journal, which was published in French in 1840 and 1842. It was not translated into English until 1982. This account is taken from The London Journal of Flora Tristan. Over every English town there hangs a pall compounded of the Ocean vapours that perpetually shroud the British Isles , and the heavy noxious fumes of the Cyclops’ cave. No longer does timer from the forests provide fuel for the family hearth; the fuel of Hell, snatched from the very bowels of the earth, has usurped its place. It burns everywhere, feeding countless furnaces, replacing horse-power on the roads and wind-power on the rivers and the seas which surround the empire. Above the monster city a dense fog combines with the volume of smoke and soot issuing from thousands of chimneys to wrap London in a black cloud which allows only the dimmest light to penetrate and shrouds everything in a funeral veil. In London melancholy is in the very air you breathe and enters in at every pore. There is nothing more gloomy or disquieting than the aspect of the city on a day of fog or rain or black frost. Only succumb to its influence and your head becomes painfully heavy, your digestion sluggish, your respiration laboured for lack of fresh air, and your whole body is overcome by lassitude. Then you are in the grip of what the English call “spleen”: a profound despair, unaccountable anguish, cantankerous hatred for those one loves the best, disgust with everything, and an irresistible desire to end one’s life by suicide. On days like this, London has a terrifying face: you seem to be lost in the necropolis of the world, breathing its sepulchral air. The light is wan, the cold humid; the long rows of identical sombre houses, each with its black iron grilles and narrow windows, resembles nothing so much as tombs stretching to infinity, whilst between them wander corpses awaiting the hour of burial. On such black days the Englishmen is under the spell of his climate and behaves like a brute beast to anybody who crosses his path, giving and receiving knocks without a word of apology on either side. A poor old man may collapse from starvation in the street, but the Englishman will not stop to help him. He goes about his business and spares no thought for anything else; he hurries to finish his daily task, not to return home, for he has nothing to say to his wife or children, but to go to his club, where he will eat a good dinner in solitude, as conversation fatigues him. Then he will drink too much, and in his drunken slumber forget the troubles which beset him during the day. Many women resort to the same remedy; all that matters is to forget that one exists. The Englishman is no more of a drunkard by nature than the Spaniard, who drinks nothing but water, but the climate of London is enough to drive the most sober Spaniard to drink. Summer in London is scarcely more agreeable than winter; the frequent chilling rainstorms, the heavy atmosphere charged with electricity, the constant change of temperature, cause so many colds, headaches and bouts of colic that there are at least as many sick people in summer as in winter. The climate of London is so trying that many Englishmen never become reconciled to its vagaries. Hence it is the subject of eternal complaints and maledictions. Source: The London Journal of Flora Tristan, translated and introduced by Jean Hawkes (Virago, 1982). 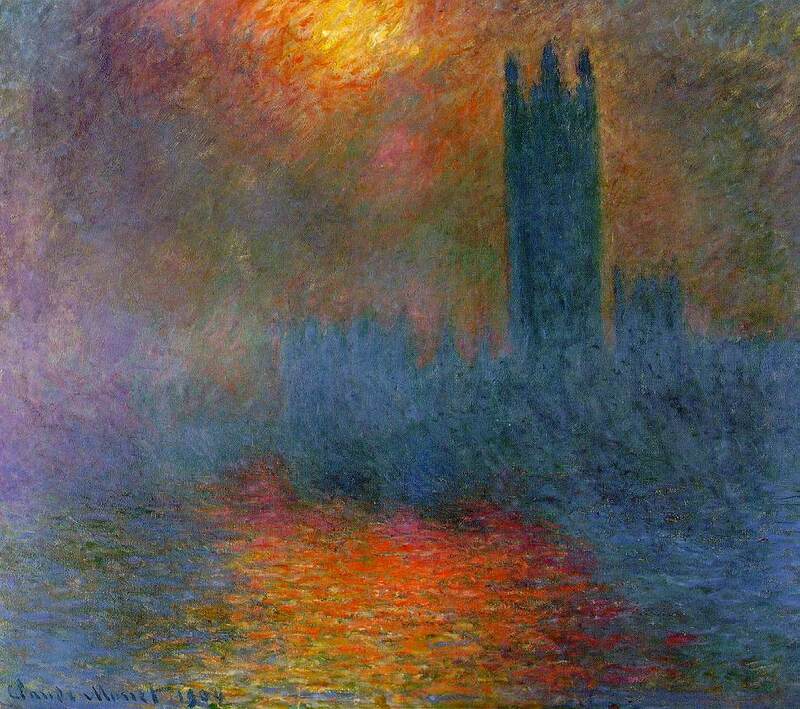 Below: London’s smog was later captured by Claude Monet, who painted a series of pictures of the Houses of Parliament at the turn of the 19th and 20th centuries. These paintings are now helping the scientific study of Victorian London smog.